Remember your very first pet, a cute little goldfish you won at a carnival? You were so excited to bring him home! But when you woke up the next morning, Mr. Bubbles had crossed over into goldfish heaven. longer – I'm talking decades! I know, it goes against all your understanding of having a goldfish. And that's because they're super low maintenance. They don't require belly rubs and walks around the block twice a day. I'm looking at you, pooches! families because of their all-too-common extremely short lifespan. Seriously, these little guys rarely last more than 5 years, and those are the lucky ones! can live as long as 25 years in the wild! That's even longer than most cats walk the earth! So why can't you manage to keep your little fishie alive for more than a few days? The answer is simple: poop. That's right, goldfish suffer from being stuck in fishbowls with their own excrement. ammonia can burn their gills! They literally get poisoned by their own poo when enclosed in a small space. they live in fresh, open water that fills lakes and ponds. making it way less harmful on our little gilled friends. to replenish it with fresh water from a nearby stream every day? But man, what a workout that would be, huh? in bodies of fresh water. And the first way to do that is to eliminate chlorine. I ain't cleaning the tank like it's a pool or something!" Well, actually, it's in the tap water from your sink or bathtub. In tap water, chlorine actually helps decontaminate water, making it safe for us to drink. So as you can imagine, it wouldn't be an ideal chemical to mix with bacteria. at most pet stores or online. Without chlorine present, bacteria will slowly start to form in your tank. just pour it into the tank. That's all before you introduce the fishies to their new home. The last step is to put some food in there. The now-existing bacteria eat away ammonia that's also present in fish food. Okay, so when do the actual goldfish come into the picture already!? The short answer is "eventually." 2 months before you bring any fish into the equation. a long and healthy life, you'll also want to pay attention to the size of the tank. And in this case, bigger really is better. but they're basically a deathtrap for your fish. Heck, even the 10-gallon tanks at the pet store can be too cozy for these little guys. 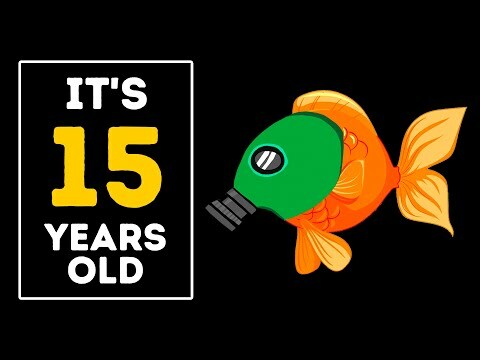 According to thegoldfishtank.com, goldfish are often sold in stores at a very young age. So if you put them in a bowl, they won't have any room to grow! As you can imagine, it's really not all-that pleasant for them. of water for fancy goldfish. (Ya know, the ones that come wearing pearls? You basically want 3 feet or so for them to swim around in. And for each additional fancy goldfish, you'll need 10 more gallons. fish and 4 feet of swimming space. You have to give them space. I mean, they're spending their whole life in the tank, after all! And don't forget that you'll have to refill around 30% of the water every 2 weeks. That's because fish actually emit pheromones and hormones into the water. Like, the size of a football kind of huge. Lastly, don't forget to give your goldfish some attention once in a while. Pay attention to the smell of the water or the way the fish's gills look. If your fish isn't excitedly swimming about, it may be cause for concern. like swim bladder, fin rot, and fungal infections. Yeah, they're as scary as they sound! Unlike goldfish, beta fish love living in bowls! remember to clean out the water regularly! Regal white cloud minnows also make for great pets. in China, you won't need a heater for the tank. This species of fish is a schooling type, which means they like to be in groups. So feel free to get a handful at a time, as long as the tank's big enough. especially if you have a hungry kitty lurking right around the corner! These are also cold-water fish that do well in groups. the fact that they don't have eyes and all, hence the name. And they live true to that name – they like to hide in dark places. when you treat them right. The same goes for any pet really! But fish in particular are a good option for people with dog or cat allergies. your carpet with yet another "accident"! Also, don't forget that fish can be great for your mental health! and actually help relieve stress. you can focus on their beauty rather than the stuff that gets you down in life! So, have you ever had a goldfish, or any pet fish for that matter? "subscribe" to stay on the Bright Side of life!